MA is our home state, and although we service all of New England, most of our roof installations are in Massachusetts. We provide Residential and Commercial roofing services for businesses and home owners, using the best flat roofing material available on the market today – IB Flat Roofing systems – PVC single-ply cool roofing membrane. Any roofing system, no matter how good it is, can leak if installed improperly – that is why we install all our roofs in accordance with IB installation requirements, MA building code, with special attention to details and the geographic location of the roofing job. For example, a roof located near the ocean is more prone to strong wind blow-offs, uplift and wind-driven water leaks. That is why in coastal areas, we double the number of heavy-duty fasteners used to hold down the roofing membrane securely attached to the roof deck. 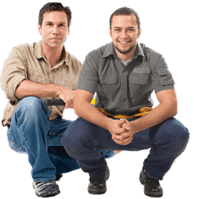 Our Moto is ‘to install every roof right, so we won’t have to go back for a service call’. This may sound a bit selfish, but it is the most beneficial for your roof, and for you. Since we match the labor warranty of our installations for the same period as the product warranty, we install every roof to be sure there will be no leaks. We will closely work with you or your builder/architect to provide the best long-term roofing solution. We invite you to use our interactive roofing cost calculator to get an instant price quote to replace your roof. To schedule a roofing project in Massachusetts, fill out the roofing estimate form. Flat Roof installed in Cambridge MA – A complete home restoration near Harvard Square of Cambridge, including a new IB PVC roof. Two layers of old rubber roof were replaced with new 50-mil IB roof, including 4 inches of tapered PolyISO insulation to eliminate ponding water. A new roof was installed on four different levels, including a roof deck all the way on the ground level, and a sloped roof covered with an IB membrane on the upper level of the roof. Flat Roof in Newton MA A new 80 mil IB PVC roof was installed as an addition to a beautiful home near Newton Center. The roof was installed with Copper Drip Edge – a new addition to IB Roof’s full line of roofing accessories. There was also a small roof deck on a balcony, which also had an IB Roof with Copper drip edge installed. PVC Roof Repair – two old PVC roofs – one in Needham MA and one in West Hartford CT, were repaired using IB PVC roofing materials. Both were repaired in the late fall / winter time. Both repairs were successful despite the fact that both PVC roofs were over 25 years old – a new IB membrane was easily welded to the old roof, after proper cleaning. – Metal Roof in Attleboro, MA – A slate impression steel interlocking shingles metal roof installed on a roof of a single-family home on a quiet street in Attleboro, Mass. Flat Roof in Lowell MA – We removed an old and leaking EPDM rubber roof, installed new 4″ ISO insulation with 24-r value and a new 50 mil IB PVC flat roofing membrane. Besides the IB roof installation overview, we point out the inherent defects in rubber roofing systems, and why homeowners should avoid installing an EPDM roof on their home and dealing with shady roofing contractors “specializing” in rubber roofs. Solar Decathlon house with IB flat roof & Solar PV panels: Team Boston (Tufts and BAC) built a solar home with innovative green construction technologies such as: 6.4 KW Solar Photovoltaic system, solar hot water and a Trombe wall – a solar-thermal-mass window/wall systems to compete in 2009 DOE Solar Decathlon. 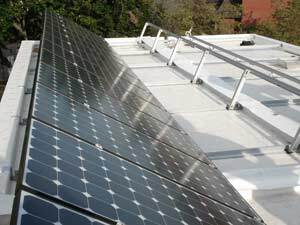 Cool Flat Roofs, together with IB Roof Systems sponsored and installed a 50-mil white IB PVC roofing membrane, with a water collection system using IB U-flow drains, and helped the team install the solar PV / solar hot water array. Old rubber roof replaced with 80-mil IB roof in Boston : The old roof was replaced, and extencive brick work on parapet walls was perforemed to ensure highest quality of installation and long-lasting protection for this house in Boston / Roxbury. Roof size was just over 400 sq. ft. and installation took a total of 8 days. Read the complete review of this roof installation with many pictures and videos. Flat roof deck in Wellesley, MA: A new construction addition was built and a flat roof deck was installed over a garage roof. We used an 80-mil grey IB roof to ensure permanent water tightness. A new deck will now be installed over sleepers, for which we welded down 2″ wide strips of membrane to protect main roof. Also, prefabricated post flashings were installed over 4×4 railing posts to insure that they would not leak. Roof installation was completed in one day. 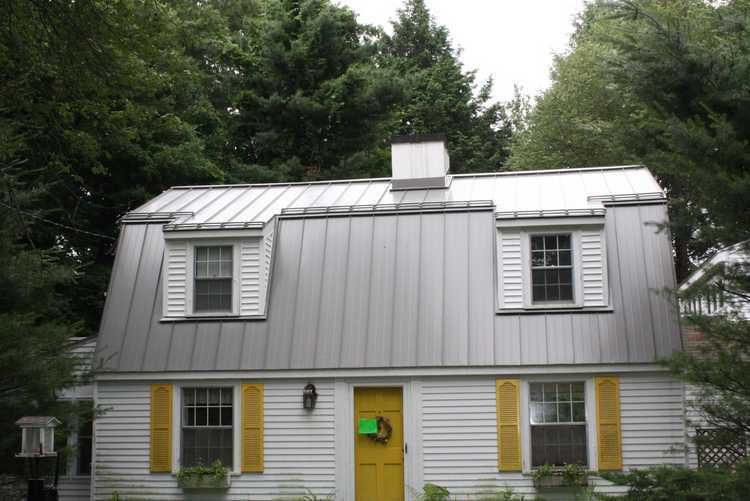 In the middle of June 2009, we’ve completed a standing seam metal roof installation. The roof was installed on a residential house in Wayland, Massachusetts. As some may recall, May and June of 2009 had lots of rainy days, so we had to cope with weather, as well as many unexpected complications, which this roofing job has posed for us. In a nutshell, the roof was constantly subjected to Ice Dam related roof leaks, due to relatively low roof slope and some heat loss from inside the house, falling ice, which would tear off the gutters in the winter and pose danger to people living and visiting the home. One of the most strange things we’ve encountered was the masonry chimney, which had a wood frame built around it and stucco installed on the outside, for visual effects. This was actually the first such chimney I’ve seen. Usually stucco is installed right over the chimney, which I though was the case here. Later, after the job was complete, we have discovered that the stucco shell of the chimney had cracks in it and was leaking. Where as before such a leak would have been attributed to the old roof, now we could easily pinpoint and eliminate the source of leaks. I did manage to find some time to seal and refinish the chimney. The moment of truth came yesterday when I went into the attic after a long steady rainfall to find the former leak site completely dry. The spot I suspected was at the joint between the concrete cap and the stucco on the front side of the house. There was a crack there that lined up with water flow marks down the side of the chimney. I think the water was able to curl under the cap to that crack and then pass behind the stucco to cause the leak. 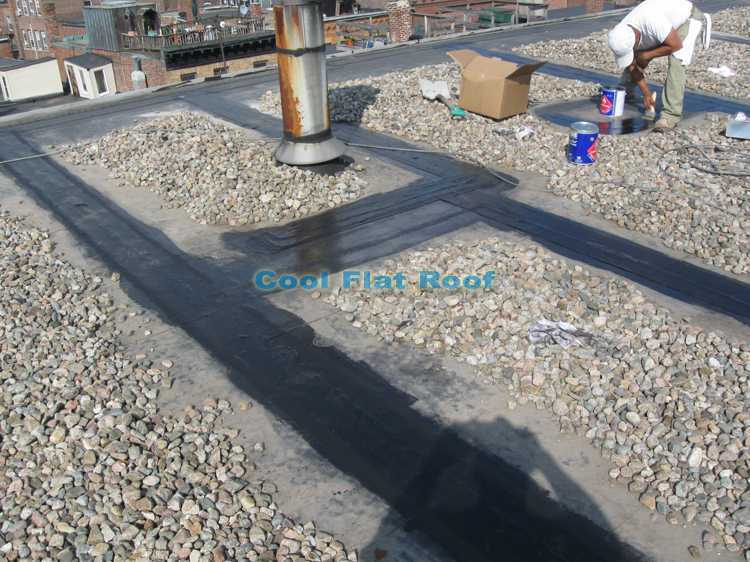 EPDM Rubber Roof repair service in Mass. Rubber roof repair in Massachusetts – we now offer a service to repair your leaking rubber flat roof (EPDM rubber roofing), for a fraction of the cost to install a new IB roof. Although it is usually a better idea to replace the roof as leak damages will only progress and throwing money away on roof repairs that last a short period of time is not economical, it may sometimes make sense to repair a rubber roof if it is only a small flashing that is leaking because of a bad seam, or failed rubber components. We can repair corner flashing (inside and outside corners), fix in-field leaking seams with rubber seam tape, or re-seam the existing seams with 9″ cover tapes, to dramatically extend roof service life. For these rubber roof repairs we use only the best flashing components such as Carlisle and Firestone peel-stick flashing and cover tapes in 6″, 9″ and even 12″ width – this allows us to be able to repair nearly every type of rubber roof leak, as well as to install new flashing around skylights, chimneys and other flat roof penetrations and curbs. 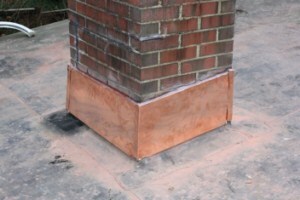 We also do custom copper flashing work when performing a rubber roof repair. As you can see in the picture above, a new copper counter-flashing was installed after a rubber corner patch was applied to the chimney flashing. The counterflashing was replaced after squirrels chewed and ate the lead flashing that was originally there. I’m building a new contemporary home in Marlborough MA. It has a low slope (flat roof) with parapets and scuppers. I was planning on using tapered i-joists to achieve the 1/4″:12″ pitch,but found the shipping cost from California was prohibitive. 2) a contractor to install the reinforced PVC (Sarnafil or equal) roof membrane and details in the next 4 weeks.